Scene Safety and Recognition of Cardiac Arrest: Check for safety and responsiveness, no breathing, and gasping. Check pulse for more than 5 seconds but within 10 seconds (breathing and pulse check can occur simultaneously). Check Pulse: Check the infants pulse by placing 2 fingers on the brachial artery. Press your index and 3rd finger on the inside of the infant’s upper arm between the elbow and shoulders. Circulation: Chest compressions circulate the blood within the patient. It's important to place your hands correctly upon the patient’s chest. Chest Compression Tempo: The correct tempo that should be performed matches the song “Staying Alive.” Make sure to push hard and fast to that song’s tempo. Use EXTREME caution when providing CPR on infants. Two Rescuers: One Rescuer should use two hands holding the infant facing up while positioning the fingers (encircling hands) in the middle of the infant’s chest as the other rescuer uses a one-way valve—placing it over the infant’s mouth and nose. One rescuer will perform compressions while the other uses the rescue valve. You can also apply a ratio of 15:2 compressions to breathing. Give one breath every 6 seconds (10 breaths/min) if an advanced airway technique is used. Airway: Make sure to lay the infant on a firm, solid surface as you would with children and adults. Kneel beside the infant’s shoulder while placing one hand on the infant’s forehead as your other hand gently lifts the chin. Next, listen and feel for any breathing for 10 seconds. 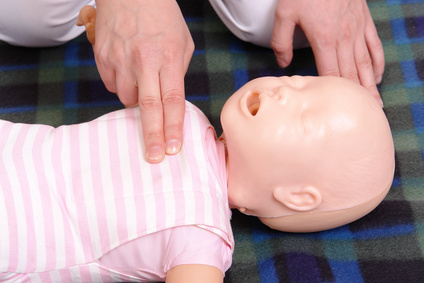 Place your cheek just in front of the infant’s mouth while checking for a pulse under the upper arm. If the infant isn’t showing any signs of life, begin the breathing technique. Breathing into an infant is different than breathing into an adult or child. Breathing: Place your entire mouth over the infant’s mouth and nose when you breathe into the infant. Make sure to perform this task with less breath than you would with children or adults. If the chest fully recoils, complete the second breath (each for one second). Check for anything blocking the airway if the chest doesn't rise completely and repeat the process. Remember, C-A-B stands for: Circulation, Airway, Breathing.